This weekend, you can enjoy some alternative music, remember the Battle of White Mountain, see photographs from Africa, and much more, all in Prague. According to the weather forecast, this weekend should be rainy. The temperatures will vary between 6°C (43°F) and 10°C (50°F) during the day and may drop to 4°C (39°F) after dark. On both Saturday and Sunday, we can expect a lot of clouds, mild rain, and wind. MUSday IC FESTIVAL OUR TIP From the 5th till the 12th of November, a cultural festival with over 20 years of tradition will be taking place in Prague. Festival Alternativa 2016, also called a “festival of dense music”, will once again play host to artists who do not fit into common musical categories. If you are fans of alternative music and want to discover some new, highly original projects and talented musicians, do not miss it. You can find more info on the festival’s web pages. On Saturday, the programme starts at 6 p.m., and the entrance fee is 80,- CZK. Address (for the programme on Saturday): KAŠTAN – UNIJAZZ SCENE, Bělohorská 150, Prague 6. FANTASY FESTIVAL OUR TIP On both Saturday and Sunday, the 4th year of the fencing and fantasy fair RepliCon is taking place. The event is relating the advantages of casual fencing trade fair and specialized seminars and lectures. This year´s theme is “women – warriors”. Find more info on the organizer’s website. 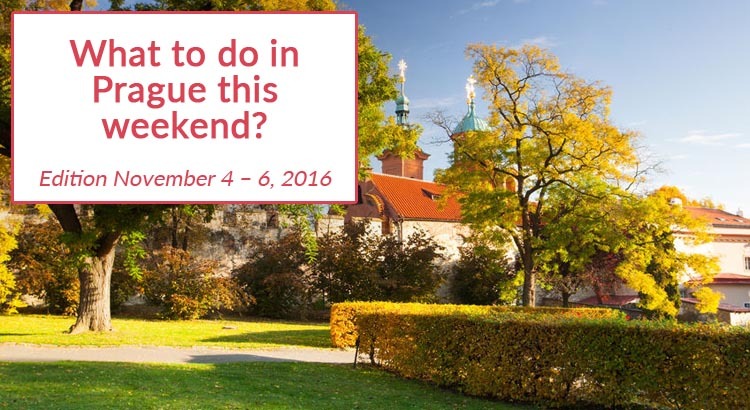 The event takes place 9 a.m. – 6 p.m., and the entrance fee is 90,- CZK. Addres: Praha-Háje, Modrá škola building, Kupeckého 576, Prague 4. HISTORICAL EVENT OUR TIP On Saturday, the Czechs will mark the anniversary of a very significant event in Czech history, the Battle of White Mountain. A “prayer for the fallen” event will be held to remember those who lost their lives. You can also see a display of contemporary soldiers’ equipment and accessories. From the Battle of White Mountain Memorial the event will move to the Church of Our Lady Victorious. The event takes place 2 p.m. – 4 p.m., with no entrance fee. Addres: Památník bělohorské bitvy (The Battle of White Mountain Memorial), Řepská 10, Prague 6. MUSIC CONCERT On Saturday and Sunday, there is a special musical event taking place, commemorating the reconciliation and friendships of the Czech and the Germans. The Stamica quartet and Radost choir will perform in the Church of Saint Anthony, and the Czech Minister of culture is one of the patrons of the event. The event takes place 7:30 p.m. – 9 p.m. There is no entrance fee. Address: Kostel sv. Antonína (Church of Saint Anthony), Strossmayerovo náměstí, Prague 7. PHOTOGRAPIC EXHIBITION From the 4th of November till the end of December, a photographic exhibition called “Terra Africa” will be taking place in the “ČSOB inspirace” premises, a Czech banks’s open space for cultural events. You can see photos by the Czech photographer Jan Svatoš, from his travels to Africa. The event commemorates the 10 years of partnership between the ČSOB bank and Zoo in Dvůr Králové. On Saturday, you can visit the exhibition between 08:30 a.m. and 7 p.m. There is no entrance fee. Address: ČSOB inspirace, Jungmannovo náměstí 767, Prague 1. CULTURAL EVENT Until the 27st of November, an exhibition focused on the female elements in art will be taking place. The presentation features the works of eight Czech female artists and shows their point of view on modern painting, sculpture, and other fields of contemporary art. The artists are of a different age, but share a free spirit. On Saturday and Sunday, you can visit the exhibition between 2. p.m. and 7 p.m. There is no entrance fee. Address: Černá labuť – Art & Event Gallery, Na Poříčí 25, Prague 1.